Guild members AUTO have raises by now! 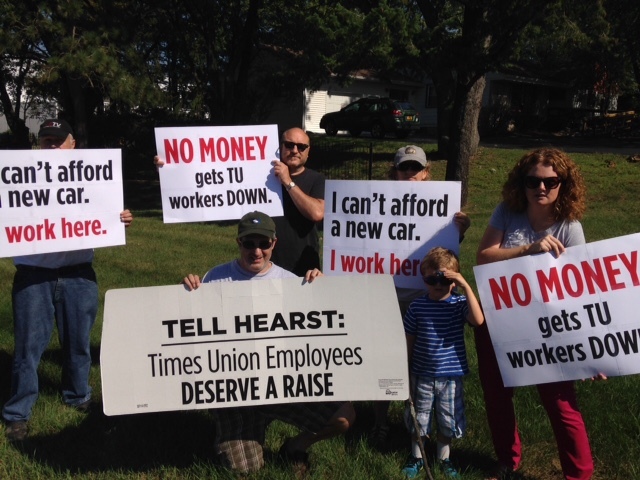 Members of the Albany Newspaper Guild rallied Saturday outside the Times Union’s car show to say 8 years is too long to go without a raise. Leading up to the event, the Guild filmed a hilarious but powerful “car commercial” about the lack of raises that racked up thousands of views. You can find it here on our web page or on our Facebook and Twitter pages. Feel free not only to like it but share it! What are the key issues? The Times Union wants the ability to outsource work without negotiation and it wants to be able to lay off the most long-serving employees without lessening an early retirement penalty or guaranteeing enhanced severance will last. In exchange, the TU proposes to give employees no raise, just a one-time $1,000 bonus. The Guild has made 10 separate offers to settle the contract since 2009 while the Company is still pushing the same proposal overwhelmingly rejected by workers.